Theresa’s cousin Larry had mentioned Fleming’s Prime Steak had a three course dinner special running. 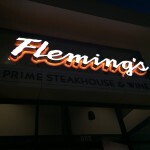 We have always wanted to try Fleming’s, so we went with him and his wife plus another one of Theresa’s cousins this past Friday. 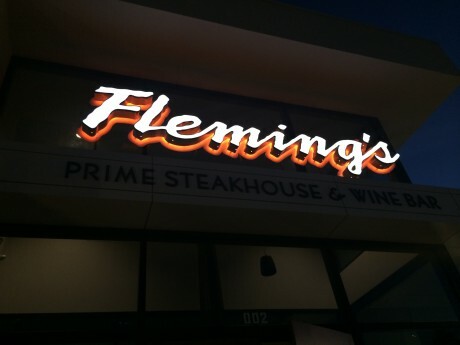 Fleming’s markets itself as a premium steakhouse, slotting between the likes of Outback and the very premium steakhouses like Alexander’s and Sundance. 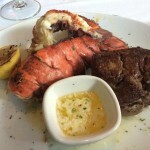 I would put it in the same category as Capital Grille. 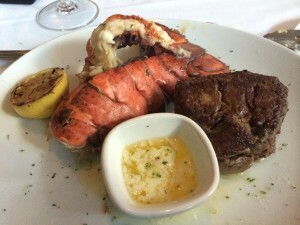 The special consisted of three courses: an “amuse bouche”, choice of soup or salad, and a surf n turf. 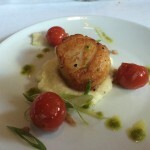 Presentation was nice, with the scallop was nicely seared and seasoned. 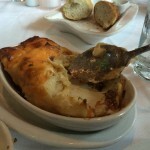 the underlying polenta had the requisite creamy texture, with the goat cheese adding a subtle flavor. In fact, Theresa and a couple of our dining companions who don’t really like goat cheese commented that they did not realize there was goat cheese in the polenta until I pointed it out. Tomatoes provided a nice acidic counterpoint to the rich polenta. My one criticism was that the scallop was a bit on the cool side, so the sear was not as “crispy” as if it were fresh out of the pan. 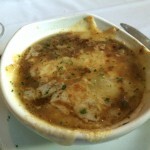 Onion soups, at least the less expensive ones, tend to be salt bombs, but the Fleming’s version was not. 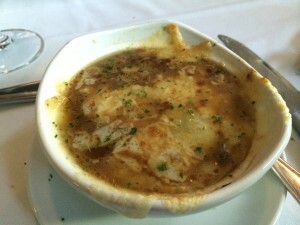 The soup base was well balanced and had a nice oniony sweetness to it. 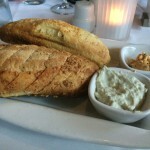 The choice of cheese was appropriate and had a good stringiness that you would expect. My soup lacked the traditional crouton underneath the cheese (perhaps I could not find it or it disintegrated into the soup). Not a huge deal, but traditionalist might miss it. The presentation was a little off in that I would have expected the cheese to be melted on top of the soup in stead of a swimming in it. This is a bit of a nit pick, but given the price point and target market segment, I would have expected something more refined. Operationally it would not be hard to ladle the soup into large ramekins, top with a sheet of cheese, and run under the broiler, and serve to the table. Lots of less expensive restaurants do this. Perhaps it’s the traditionalist in me. 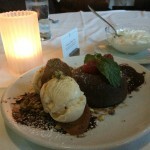 Our entrees were delivered to our table, with a warning that the plates are extremely hot. The filet had a nice looking sear on the outside. Cutting into it and taking the first bites, I could tell the quality of the steak was good (i.e. 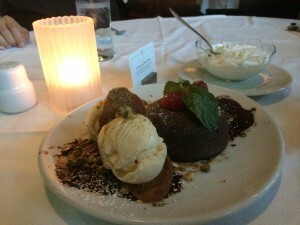 much better than what you would get at an Outback or Black Angus, as expected of a restaurant in this tier),. 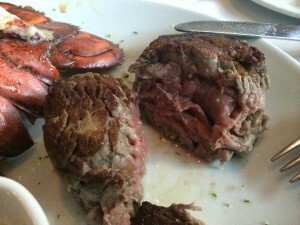 My filet came out as shown above. I ordered it medium rare, but my feeling was it was closer to the medium than medium rare side. 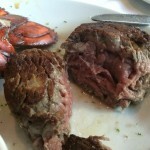 It was not enough to send the steak back, but it was not my idea of a perfectly executed medium rare steak. My steak was also underseasoned (or perhaps unseasoned? ), requiring me to add salt, whereas Theresa’s and others’ were fine as served. 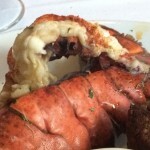 The same could be said of my lobster tail. You could clearly tell by the curl and general appearance that the lobster was a bit over cooked (at least for my taste). Again, it was not cooked to the point where I would send it back, but I would expect a restaurant on this level to pay attention to these types of details. My dining mates also had similar comments, with each of us having varying degrees of doneness for both the steak and the lobster. My suspicion is the plates were held under a warming lamp, broiler, or oven for too long after initial cooking. 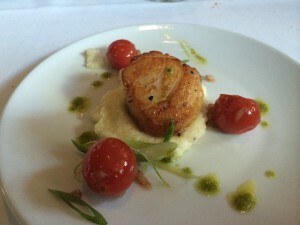 While my overall experience at Fleming’s was a positive one (good atmosphere, service was fine, the food was good, but not great), I am a bit nagged by the inconsistency in execution and lack of attention to detail in the back of the house for a restaurant in this price category. 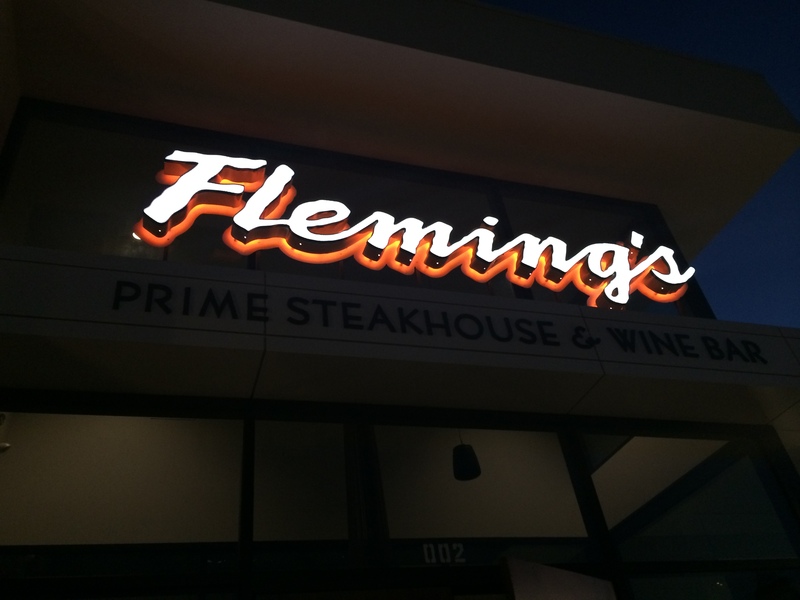 Perhaps Fleming’s suffers from the same challenges all chain restaurants have in execution, which is what I felt my case was on this visit. 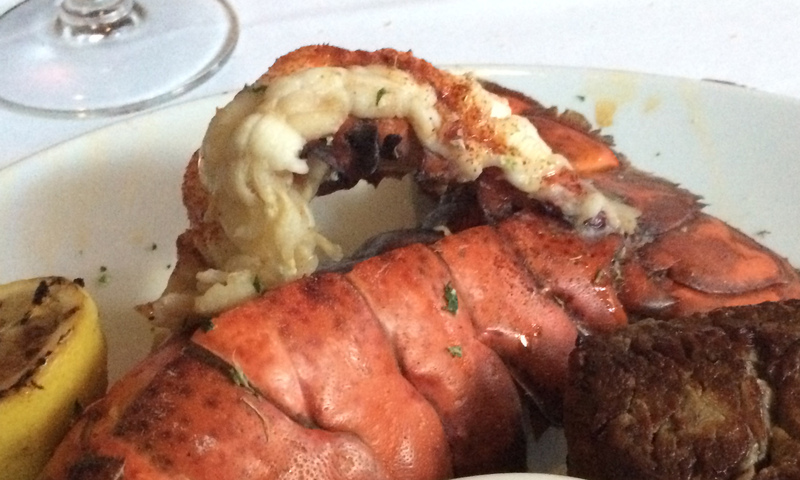 With steaks and seafood, proper cooking and timing the delivery of the entrees are critical. For the price, I would have expected more and I don’t think they delivered the incremental value over their less expensive competitors. I am glad we got to try the experience with the less expensive offer, as the prices for their normal entrees is what I would consider pretty high.